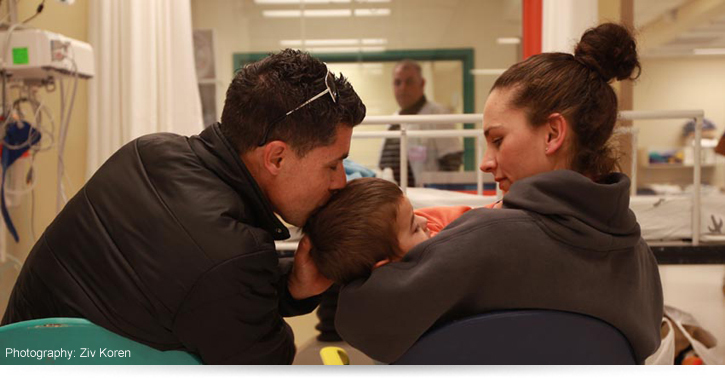 Schneider Children’s Medical Center of Israel abides by the Patient’s Rights Law as legislated in the Knesset on May 1, 1996, which formalized the relationship between patients requiring treatment and medical professionals. The Law stipulates behavior norms and codes regarding patient’s rights that are binding on all medical professionals. The medical staff and the patient are partners in the medical treatment process. The law is based on the assumption that the patient is a cognitive person capable of demanding his right to proper medical care. The opening paragraph of the law states: "This Act aims to establish the rights of every person who requests medical care or who receives medical care, and to protect his dignity and privacy". The right to receive medical treatment is assured to everyone. Neither the medical facility nor the clinician administering the treatment may discriminate between patients on grounds of religion, race, gender, nationality, or origin. Medical treatment should be provided according to existing terms and arrangements in the health system in Israel. In case of medical emergency - the patient will receive unconditional treatment. The patient is entitled to suitable medical care both from the standpoint of medical and professional standards and quality, as well as proper personal relations. The patient is entitled to know the name and professional position of every caregiver. The patient is entitled to request, or to obtain at his own initiative, a second opinion regarding his medical care. The clinician and the medical facility shall provide all assistance to the patient in fulfilling this right. In cases where a patient transfers from one clinician or facility to another, he is entitled, at his request, to the collaboration between the clinicians or facilities involved, to ensure proper continuity of care. The dignity of the patient must be assured at all stages of medical treatment. The privacy of the patient must be assured at all stages of his care. Whenever a patient’s life is in grave danger or he is in a critical medical condition, he is entitled to unconditional medical treatment (see para 1). The clinician to whom he approaches or is referred is obliged to examine and treat the patient to the best of his ability. If the patient is in grave danger and he objects to treatment, the clinican should provide the required treatment even against the patient’s will. This can only be done following authorization by the Ethics Committee which is a mandatory body in every medical institution. Medical treatment shall not be administered to the patient unless he has given his consent. Such consent must be "informed consent", i.e. only after the patient has received all data concerning the diagnosis, the anticipated process of the disease, the nature of the proposed treatment, the chances of success, the risks of the treatment including pain and discomfort, and the chances and the risks of alternative treatment or the lack of any treatment at all. The clinician shall furnish the information to the patient at the earliest stages of treatment and in a manner in which the patient can understand, so that his consent is “informed” and given freely. The doctor or medical team is obligated to provide the patient with this information. The consent for medical treatment may be in writing or conveyed verbally or demonstrated by the patient's behavior. The patient is entitled to receive full disclosure from the clinician or from the medical institution pertaining to all data in his medical records including a copy thereof. Nonetheless, if the clinician feels that full or partial information may cause serious harm to the patient's health or endanger his life, the clinician may decline to convey such information to the patient. Such refusal requires the approval of the Ethics Committee. A clinician or any other staff member of a medical institution who has treated or come in contact with a patient during the course of his duties, will maintain patient information confidentiality. A clinician or a medical institution is allowed to disclose information to a third party provided the patient has given his consent. Information may also be released to authorities if the clinician or the institution is obligated to do so by law, or if the information is required for continued treatment.